Newly-elected Dem-socialist Alexandria Ocasio-Cortez showed us who she stands with after President Trump addressed the nation on the border crisis on Tuesday. Trump spoke of the “humanitarian and security crisis” that is taking place on the southern border and called for Democrats to stop obstructing him & approve funding for a wall. Ocasio went straight to anti-Trump network MSNBC to deliver her own rebuttal to the president and gave us a glimpse of what she really thinks about our country. Kolfage is right. All Americans have to follow the nation’s laws. Those illegally entering the country right off the bat start by breaking them! Airman Kolfage gave both of his legs & an arm while serving in Iraq to keep Americans safe after the 9/11 attacks. There’s nothing more American than that! Signing up to fight to keep terrorists from killing more Americans, and being willing to die doing it! What has Ocasio ever done for our country? Nothing! Except open her ignorant mouth & spout inanities! 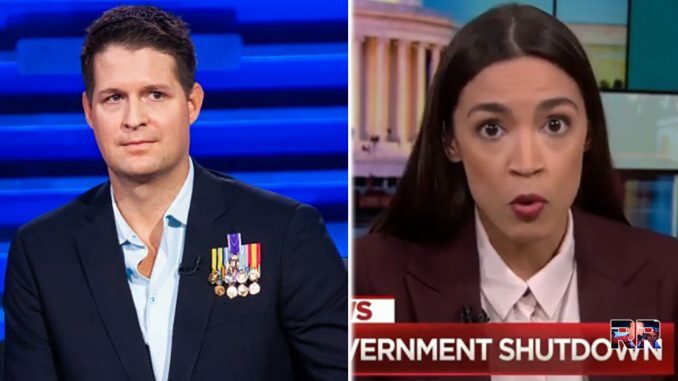 Share this if you support Airman Kolfage & think Ocasio should keep her mouth shut!